Before she died, my friend Martha and I kept promising each other that one day we would debate—preferably over a luxurious dinner and a bottle of wine—the question of women's ordination to the priesthood. Martha was herself a priest, and neither of us had any interest in debating that as a question. To my mind, it was no question. Martha had clearly been called by God to Holy Orders in the Anglican Church. Whenever I attended a Eucharist at which she was presiding, I knew she was fulfilling her calling. On those mornings, she would walk down the center aisle of the church after pronouncing the absolution of our sins and recite what we Anglicans call the "comfortable words": the verses of Scripture that are to be read following the moment of confession and absolution, verses that assure the worshipers of God's pardon and fatherly goodness. "Come unto me, all ye that travail and are heavy laden," Martha would say as she walked among the congregation, looking us in the eye with that quirky and comforting smile she had, "and I will refresh you." "This is a true saying, and worthy of all men to be received," she would continue, looping back to return to the altar, "that Christ Jesus came into the world to save sinners." Those moments, when through a blur of warm tears I would hear Christ's own welcome through Martha's voice, are permanently lodged in my memory, and they are part of the reason I had no interest in disputing her vocation. What I did want to discuss with Martha, before cancer took her life, was why and how God had called her to the priesthood. I disagreed with her that the dancing, mutually indwelling Persons of the Trinity somehow modeled an egalitarian social order for the human sphere, of which women's ordination would be one instance. Aside from the historical problems with such a position (to the Greek church fathers who popularized the term, "perichoresis" didn't mean "dance"), I had theological worries about it. Too often, it seemed, Christians would embrace a particular vision of human gender relations, then—lo and behold—they would discover that the intra-Trinitarian relations themselves presage such a vision, and then, in turn, they would describe those Trinitarian relations as the rationale for the human gender relationships that prompted the whole circular pattern in the first place. I remember one night, sitting in Martha's living room with a large gathering of members of her church, listening to her try to make a case from Scripture for the ordination of women, and I thought, "No, this is all wrong. I agree with the conclusion, but I don't agree on the way to get there." If there is no specifically masculine or feminine charism or ontology, the significance of the priest's maleness fades away. Martha and I can no longer sit down to dinner to debate the matter, and I grieve the loss of one who was not only a pastor to me but a conversation partner and beloved confidant. Still, I like to imagine the conversations she and I might have had. 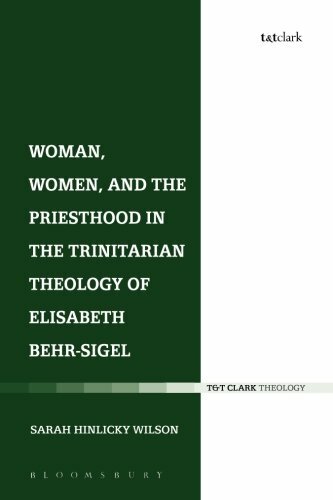 In particular, I like to imagine what intellectual and spiritual depths we might have explored together once I'd handed her a copy of Sarah Hinlicky Wilson's revised doctoral dissertation, Woman, Women, and the Priesthood in the Trinitarian Theology of Elisabeth Behr-Sigel. An ordained minister in the Evangelical Lutheran Church in america and assistant research professor at Strasbourg's Institute for Ecumenical Research, Hinlicky Wilson has written the best account I've seen of how someone may, mid-career, come not to abandon one of her chief theological convictions but to question and ultimately abandon one particular way of arriving at those convictions. Hinlicky Wilson's book is about the intellectual development of one of the 20th century's most prominent lay theologians, Elisbeth Behr-Sigel (1907-2005). More specifically, it is about how Behr-Sigel gradually outgrew one way of advocating for a change in the Eastern Orthodox way of understanding who was eligible for the priesthood and eventually embraced a more sensitive, complex way of advocating for it. Behr-Sigel got her start reflecting on the issue only later in life, when she was pushing 70. She already had 43 years of theological scholarship under her belt, most of it devoted to Russian spirituality and the practice of hesychasm (a kind of contemplative prayer). But in 1976, she was invited to give the keynote address at an international gathering of Orthodox women at the Agapia convent in Romania, the first gathering of its kind, and she needed to address "the basic question of what part Orthodox women could play in church and society." It would prove to be the beginning of an exploration that she would pursue for the rest of her life.